Many of us do own a TV in our homes, and these TVs tend to be mounted on the wall. Where then, do you place the speakers? Assuming you are one of the few rare people who place your flat screen TV on its stand, then you might want to consider picking up the Sonos PLAYBASE. The Sonos PLAYBASE will be able to slide right underneath your TV, as it delivers a powerful home theater sound whenever the TV is on, as well as handle music all the time while it is turned off. The Sonos PLAYBASE is the latest addition to its wireless home sound system, and this is the latest speaker in their home theater range. 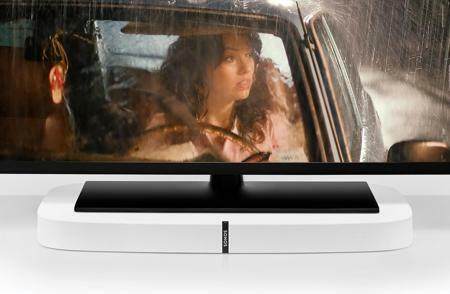 The PLAYBASE is a thin and yet powerful speaker, where it remains discreetly under the TV. With an asking price of $699 a pop, you will be able to find the PLAYBASE arrive in black and white shades with availability kicking off from early next month onward. The Sonos PLAYBASE measures a mere 58 mm in height, where it packs a whopping 10 drivers. With the PLAYBASE, it offers everything that one can expect from a Sonos speaker. Offering great sound and music playback, it has been specially designed to disappear into the home. The way it has been designed makes the Sonos PLAYBASE look as though it has been cut from a single piece of granite. Apart from that, it also challenges traditional expectations of sound, all coming from a thin speaker. There are no visible seams that result in incredibly clean lines, while sporting an ultra-flat top surface with over 43,000 holes which make up an acoustically transparent grill. The manufacturing process involves a complex insert molding process as well as a custom-designed glass-filled polycarbonate exterior that ensures vibration is kept to a minimum, enabling it to withstand the weight of a TV for a very, very long time.